Fowler Museum to present photos of duo’s 1891 bicycle trip from Greece to Uzbekistan. - Bicivilizados. Ciclismo urbano. Alegría entre tus piernas. Fowler Museum to present photos of duo’s 1891 bicycle trip from Greece to Uzbekistan. 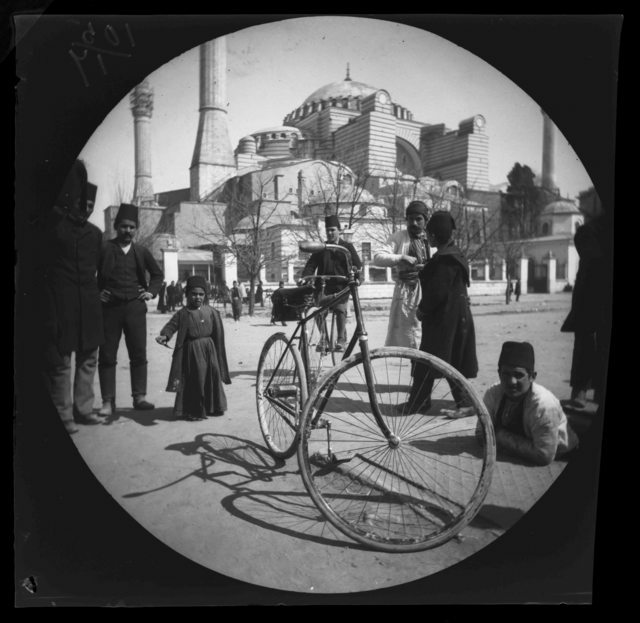 Home / bike culture / Fowler Museum to present photos of duo’s 1891 bicycle trip from Greece to Uzbekistan. In the summer of 1890, two young Americans, William Sachtleben and Thomas Allen Jr., set off to circle the globe on new-fangled ‘safety’ bicycles. Three years later, after pedaling some 18,000 miles across three continents, their harrowing tales of adventure made them international celebrities. Their timely championing of the bicycle helped spark the great bike boom of the mid-1890s, which transformed cycling from an elitist, male-dominated pastime into a wildly popular means of recreation and transportation for all. Along the way, Sachtleben and Allen chronicled their adventures with two novel compact Kodak film cameras, heralding a new “democratic” era for photography, as well. 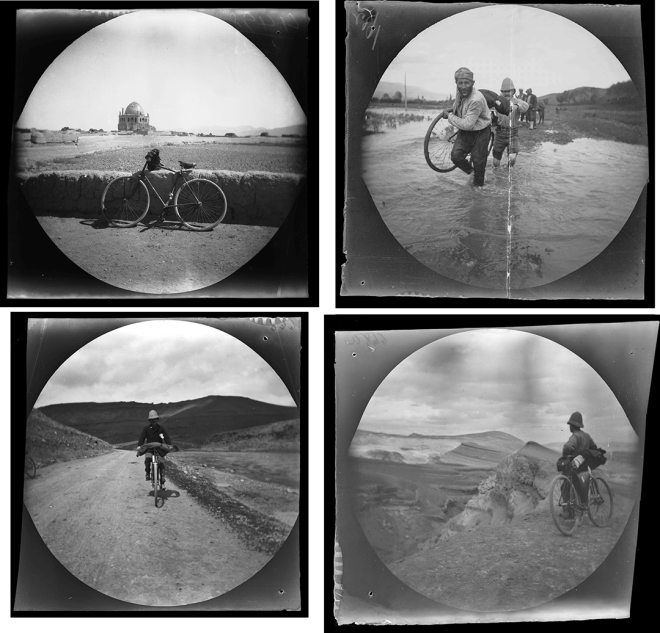 “Round Trip: Bicycling Asia Minor, 1891” — on display at the Fowler Museum from Dec. 14 through April 5, 2015 — features 42 circular black-and-white photographs taken by the cyclists and reproduced from recently scanned negatives held by the UCLA Library Special Collections. The images track a year on the road between Athens, Greece and Tashkent, Uzbekistan, and their accompanying captions are based on Sachtleben’s meticulous notes, written on the envelopes that contained each original negative. The photographs vividly convey what the two adventurers experienced as they pedaled across barren dirt roads, river crossings, mountain passes and volcanic terrains, encountering people and cultures entirely foreign to them. The scenes of everyday life also reflect how the locals — many of whom had never before seen a Westerner or a bicycle — reacted to them and to the marvelous technologies that were destined to change ancient ways of life. During their three-year journey and using a new, compact Kodak camera, Sachtleben and Allen traversed Europe, Asia and North America and recorded some 1,200 circular images on 3.5-inch nitrate negatives. Only about a third of the negatives are known to have survived, and these are now part of the Sachtleben Collection kept since 1984 by UCLA Special Collections. The negatives were scanned in 2013 — a complicated process, given their fragile and combustible state. The exhibition features four of the countries Sachtleben and Allen toured in 1891, arranged chronologically: Greece, Turkey, Persia (Iran) and the Russian Empire (Turkmenistan and Uzbekistan). Approximately 10 images have been selected from each country, and enlarged to 20 inches in diameter.